EZComplete Premixes balance just plain meat. This means boneless. The meat you purchase must be boneless, or you need to remove and discard the bone at home, so you can use just the meat for making food with EZComplete. At Food Fur Life, we encourage the inclusion of at least three proteins in rotation. To prevent sensitivities or food boredom, we recommend including at least three different animals sources in your diet rotation. If your cat or dog has gastrointestinal sensitivities or Inflammatory Bowel Disease (IBD), please introduce each new protein made with EZComplete slowly and one-at-a-time. ALL cats should be introduced to new food and new proteins slowly. Please refer to How To Transition your Dog to EZComplete or How To Slowly & Properly Introduce EZComplete fur Cats for more information. Shopping for meat for your pet can be fun and easy! There are many options, but there are also a few considerations. Skin on or No skin? Fur Cats: Whether or not to include skin depends on the weight of your cat. Skin is fatty, and adds calories to the meals, but do bear in mind fat is an essential component of a healthy diet - and skin is more than just fat, it includes collagen, which has roles in joint and gut health. The question is how much to include? If your cat needs to lose weight, it’s better to skip the skin (but don't trim any of the fat). If your cat needs to gain weight, include some meats with skin. If your cat is a healthy weight, we suggest including half of the skin in some batches and not others. If your cat has issues with constipation, the first place to start is upping the fat in kitty's diet. Include the skin and feed fattier cuts of meat. Increasing fat moistens stool and increases transit time. Finally, the inclusion of skin also increases the variety of tastes for your kitty. Most cats enjoy fatty foods, and healthy cats do very well with fat. Please note: while fat is not indicated as a factor in pancreatitis in cats and lower fat diets are not recommended for cats with pancreatitis, some who have cats with pancreatitis find their cats feel better and have fewer flares when on a lower fat diet. Thus we recommend skipping the skin for cats that have pancreatitis. Fur Dogs: Healthy dogs need only moderate amounts of fat in their diet. Fatty diets cause problems with pancreatitis in dogs, thus it is best to be judicious when including skin and do trim fatty cuts of meats. Fat also has almost twice the calories of protein. Skin is fatty, and adds calories to the meals, but it is more than just fat. Skin includes collagen, which has roles in joint and gut health. If your dog needs to lose weight, it’s better not to use any skin in the diet. If your dog needs to gain weight, it's a good idea to include some skin. We suggest including half of the skin from poultry in several meals per week (assuming you make several batches of food with different proteins. Treat a batch with some skin as another batch of food to have in rotation). The inclusion of some skin increases the variety of tastes for your dog, and they do enjoy it. Please note, however, that low fat diets are indicated for dogs with pancreatitis. If your dog has been diagnosed with pancreatitis or exocrine pancreatic insufficiency (EPI), please do not include the skin. Sodium Level in Meat. When shopping at your local supermarket, check the label for the sodium content - this is of particular concern in the U.S. 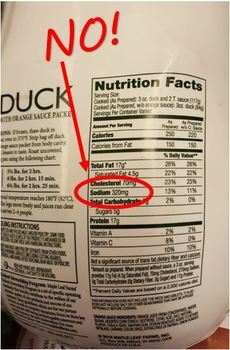 Some meats (particularly duck, chicken and pork cuts) are “enhanced” with a sodium solution. They are not always clearly marked, and the labeling can be deceptive or confusing. The easiest way to make sure you are not buying an enhanced meat is to check the sodium level per serving (servings are a standard 4 ounces in the U.S.). If the amount of sodium per serving is less than 100mg, that meat is safe for your cat. If the amount of sodium per serving is more than 100mg, don’t buy it, it will provide too much salt, and may make your dog or cat throw up or feel sick. 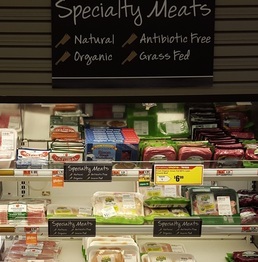 If the product isn’t labeled with a nutritional panel, ask a meat department representative for the nutritional panel of the meat product in which you’re interested. Please note that heart disease is common in dogs. Being mindful of the sodium content of your meat choices can be very important, especially if your dog has already been diagnosed with hypertrophic cardiomyopathy (HCM). Sodium in the diet doesn't cause HCM in dogs, but if your dog has HCM, sodium control in the diet is indicated. Ground Meat. Whether or not to purchase ground meat at a supermarket is controversial, and most sites advise against it. The primary reasons for advising against it are related to potential degradation of nutrients and concerns with bacteria. Some nutrients are degraded by exposure to light and oxygen. Meat is typically packaged in clear plastic, and we have no idea whether the package has been sitting out for three hours or three days. The potential for bacteria in pre-ground meat is of some concern (though our cats are equipped to manage bacteria levels that would be harmful to humans). The problem with grinding is that the process increases the surface space exponentially. If the equipment wasn’t properly cleaned, bacteria can get ground into the meat, and it multiplies more quickly on that large surface area. This typically is not a problem for healthy cats and dogs, they have defenses to manage levels of bacteria completely inappropriate for humans; it is riskier to feed this to our pets with health issues. If you want to purchase pre-ground meat, it is best to purchase those in vacuum-sealed packages rather than the meats ground at the store; from a butcher where it is freshly ground; or from a pet food supplier, where it is intended for pet consumption raw, appropriate safety measures are taken with that in mind, and the product is immediately flash frozen. Preservatives. Fresh meat rarely contains preservatives, unless there is some kind of sauce or marinade on it. Any sauce, seasoning, or marinade already makes it an inappropriate candidate for feeding it to our cats. But it is becoming increasingly popular for meat packers – as opposed to the butcher at the supermarket – to prepackage ground meat. These meats often contain a preservative; many are identified as a “natural” preservative. A popular choice is rosemary, associated with seizures in small animals. One of the reasons the owners of EZComplete switched to raw feeding for their pets was to avoid ingredients like this. It is small amounts, and it is very unlikely it will be in every protein you use to feed your pet. But it is our job to make you aware of the potential, so you can make an informed choice prior to purchase. Organic? Naturally Raised? Pastured? The meat you purchase for your pet doesn’t have to be any of these. We do encourage you to feed the highest quality meat you can afford – to your pets and your family (if you eat meat, too). Some people choose to support local farmers when possible. Your budget is usually the limiting factor when shopping for meat. Pastured animals will have meat with a better balance of omega 6 and omega 3 fatty acids; they will typically contain higher levels of many minerals and a wider variety of trace minerals (no worries, these won't be in amounts that will cause problems if using the EZComplete premix). But these meats will cost more, especially if they are also fed organic feed and/or raised in organically managed pastures. Your local supermarket. Read the flyers, stock up when there are sales! Local farms. Some sell direct-to-consumer on the farm or at the Farmers Markets. Check the health-food store, they may carry locally raised meats. Co-operatives. Join a raw feeding or BARF (Bones and Raw Food) Yahoo group for your area (if there is one). In some places, these members are mostly dog owners. But they may have meat purchasing co-ops, and whether feeding a cat or dog, meat is meat! With these co-ops, you can join and take advantage of lower pricing through the larger bulk purchasing by members of the group. Online. For meats you want to include in your pet's diet that you may not be able to find locally, there are suppliers that ship frozen meats. Please see our Online Meat Suppliers - Resource Links. Just remember, if purchasing ground meat, buy it boneless. Or cuts of meat on the bone you can debone at home. If friends or family hunt, you can accept meat for your pet. Freeze any wild game for at least three weeks in a deep freezer prior to feeding any of it. Do not feed any hunted (vs farm raised) wild boar, wild pig or bear (and if you live anywhere this would be an option, do not feed walrus), these animals can carry a disease, pseudorabies, that is not necessarily killed by cooking or freezing, and it is fatal to cats and can be fatal to dogs. Please do not feed squirrel, leptospirosis is not killed by freezing. Anything you think your dog or cat may like! It is important to know that each cut of meat (breast, shoulder, leg, thigh, etc.) does have a different nutritional profile. Dark meats are more nutritionally dense than light meats; they also contain more taurine (though the premix ensures there is sufficient taurine no matter which meats or cuts you use) and are usually fattier than the light meats. Chicken breast and turkey breast have more methionine than thigh or leg meat; this can be important for pets prone to a high urine pH / struvite crystal formation. So please include different cuts of the same proteins to provide a wider variety of tastes and nutrition for your pet!